Enabling users to sign in to your site without having to remember a new password is clearly one of the best ways to increase participation and interaction in your site. Requiring users to create and remember a new password creates friction, by reducing that friction you can increase participation, interaction and sales in your site. The Social Login service from Janrain, provides this more user friendly sign in solution that is easy for users to understand. Below is what the user sees (and you can see it when you sign in or register on this site). You can configure which account providers are shown and in what order. If you enable more than 6, then the next ones are shown on a second page if the user clicks "More Providers". This is very user friendly and easy to understand, the user just clicks the account type they already have and are able to register or sign in without having to learn or remember a new password. It is also secure, the authentication is done via the service providers and the user's password is not shared with your site. Its very easy to get a free Janrain Engage account. Just sign in to your mojoPortal site as a user in the Administrator role and go to (Key icon) Administration Menu > Site Settings > Security > Open ID. 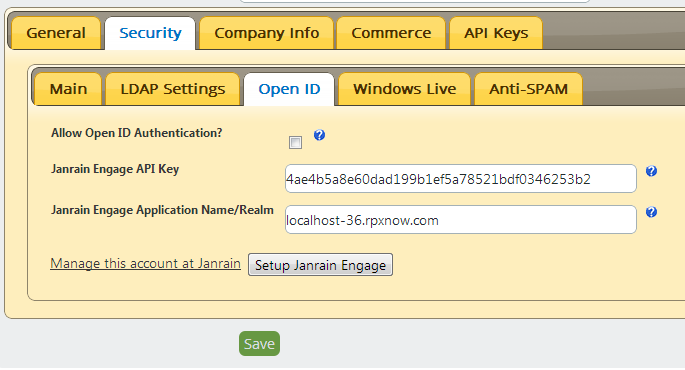 There you will see the inputs for entering your Janrain Engage API key and Application Name. If you already have an API key, you should paste it in and click the Setup Janrain Engage button. If you don't already have a Janrain Engage account, just leave it blank and click the Setup Janrain Engage button. You will be redirected to their site where you can create an account. After you create the account, their site will automatically redirect you back to your site and your account settings will be configured automatically and your settings will be something similar to what you see below. I use this service here on mojoportal.com and I think it has definitely increased the number of users who register on this site.